I've been re-reading The Intelligent Investor with the goal of quantifying Benjamin Graham's guidance. My goal is to develop a framework (and a spreadsheet) with key metrics consistent with Graham's way of thinking. In his classic book, Graham outlines suggested requirements for defensive investors (aka passive investors) in selecting stocks and building a stock portfolio. The big idea is to develop a checklist or screen of some sort that enables me to rely on reason rather than emotion when buying and selling stocks. These guidelines could be passed along to a financial advisor as a way of specifying requirements. To find such companies, I'll look at stock screeners and other tools offered by Fidelity, Schwab, TD Ameritrade, and Vanguard. First, let's define large companies. I'll contend that large companies are “large caps”or “mega caps” in terms of market capitalization. For purposes of this article, I'll define “large caps” as companies with a market capitalization of $5 billion or more. Within this set, there is a subset of very large companies (mega caps) with a market capitalization of $200 billion or more. To determine market capitalization, multiply a company's stock price by its outstanding shares. For example, the market cap of Apple is $174.59 (share price on a given day in 2017) x 5,090,000,000 (5.09 Billion, number of outstanding shares) = $888+ billion. Depending on your definitions, Apple could be considered a large-cap company or a mega-cap one. Going back to the idea of using stock screening tools at your favorite brokerage firm to find large companies, note that various firms have varying definitions of large. Nevertheless. finding these tools and the large designation is easy. Look for “market-capitalization criteria” and do either of the following: a) select “large cap” companies or b) specify a dollar value associated with market capitalization, such as $5 billion. For example, look for market-capitalization criteria and select “large cap” at Schwab. Alternatively, specify a desired size, such as $300 billion and above. At Vanguard, select stocks with a market capitalization of $5 billion or more. At Fidelity, large-cap companies are those with market capitalization of $22.28 billion and more whereas TD Ameritrade uses $5 billion as its minimum. Graham's definition is straightforward in regard to prominence: the company should rank in the top quarter or third of its industry group. After you've identified large companies, determine whether these companies are prominent. Certain brokerage firms, such as Fidelity and TD Ameritrade, provide details about selected stocks that allow me to identify whether a particular company might be considered prominent. These firms also provide methods of evaluating a company in comparison to its peers. To identify which companies are the big players in an industry, look at “Total Revenue” and “Market Cap” (as previously mentioned; here, you can see how a large company compares in size with its peers). The other info, such as profit margin, is useful but doesn't indicate prominence. Again, there's more useful information but right now I'm looking for statistics pertaining to prominence or relative size only. Note that there are certain companies with innovative products that aren't easily categorized and may not have peers; however, these companies are not likely to be ones suitable for a defensive investor. Graham suggests a definition of conservatively financed when “common stock (at book value) is at least half of total capitalization, including bank debt.” I classify long-term debt as bank debt whereas accounts payable balances represent debt associated with vendors (bills due but not yet paid). Graham's rules can be relaxed or modified depending on the industry (according to Graham himself, not me); for example, utility companies may have higher debt as they typically have a persistent need for financing of infrastructure improvements along with relatively steady income from customers that consistently use its services. To identify conservatively financed companies, I use two techniques: a) perform calculations, drawing numbers from balance sheets and b) use stock screening tools to apply criteria associated with debt load. Both are available on brokerage firms' websites. The results is 97%, well over Graham's requirement of 50%. So, at 97% (more than 50%), Google/Alphabet is considered conservatively financed. Alternatively, use these criteria available via stock screening tools: Debt to Equity (which compares debt to shareholders' equity) or Debt to Capital (which compares debt to shareholders' equity plus debt). Using this approach, I'll want my ratios to be low. For example, again using Google/Alphabet, debt to equity is $4,000/$139,000 = 2.88 and debt to capital is $4,000/($139,000+$4,000) = 2.80. There may be nuances to the way these ratios are calculated and presented by brokerage firms but these numbers should approximate the ratios. Basically, less debt is better than lots of debt as a percentage of assets. Stock screening tools and similar resources offered by brokerage firms are useful in finding large, prominent, and conservatively financed companies. The simple steps involve finding companies that are large and conservatively financed first. Then analyze these results to identify companies for prominence. For example, sort these companies by market cap (or other size criteria) to locate the top-tier ones. Again, after you've located stocks using these screens, you can then evaluate individual stocks to identify prominent companies and compare them to their peers. Graham suggests classic rules for investors in The Intelligent Investor. Here I've analyzed what I believe he means when he recommends the criteria of large, prominent, and conservatively financed. Through this process, I have been fascinated to learn that many screening tools focus more on short-term results and technical movement (that is the biases of “Mr. Market”) than fundamentals. As far as my personal preferences, I definitely favor companies that are conservatively financed. In addition, I tend to like ones that are large and prominent. 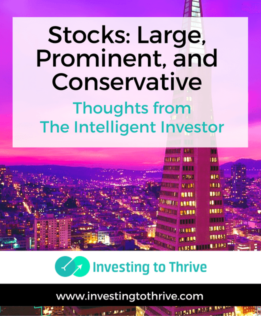 What I've noticed is that requiring myself to buy stocks that meet specific criteria has yielded much better results than choosing a company based on enthusiasm or perceived potential for growth. That is, when I've chosen within established guidelines, I've been more apt to choose wisely. So, to Graham's point, a disciplined investor first determines criteria and then find selections that match these criteria. Disclosure: I'm long on GOOGL. Do you like large, prominent, and conservatively financed companies? What criteria do you use when making stock buying decisions?